American manufacturer Vizio announced today that its recently launched 8-inch multimedia tablet will support Hulu Plus in the United States. According to Vizio, this marks the first time that an Android tablet will have official support for the Hulu Plus streaming content. “The Vizio Tablet was designed to provide a world class Internet content experience and we are proud to be one of the first Android-powered tablets to support Hulu Plus™,” said Chief Technology Officer Matt McRae of Vizio. Vizio tablet owners can subscribe to the Hulu Plus service for $7.99 per month. We imagine that users will be able to easily output the content through the HDMI-out port of the tablet. The 8-inch Vizio VTAB1008 tablet recently went on sale for $299. The device is equipped with Android Gingerbread, a 1GHz CPU, 1024x768 resolution screen, 512MB RAM, mini-HDMI out,a microSD slot and three built-in speakers. An IR blaster is found on the top edge of the tablet with a listed 95% compatibility rate for consumer electronics in the United States. IRVINE, Calif., Aug. 24, 2011 /PRNewswire/ -- VIZIO, America's #1 LCD HDTV Company*, announced today that the new VIZIO 8" Tablet with WiFi will support the Hulu Plus™ subscription service. The highly-anticipated app will bring the extensive library of TV and film content from over hundreds of providers and independent creators to subscribers using the VIZIO Tablet for just $7.99 per month. Allowing users to find and enjoy premium content on their own schedule, the Hulu Plus™ subscription service complements VIZIO's mission to bring high-quality technology and "Entertainment Freedom™" to consumers at an extraordinary value. The subscription service offers instant access to current and past seasons of shows like 30 Rock, Modern Family, The X-Files, Arrested Development and Family Guy. 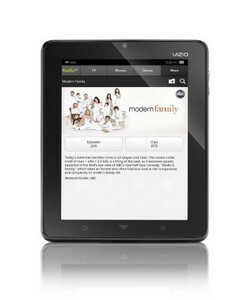 Last week, VIZIO's feature-packed, multi-media Tablet hit retailers nationwide at a price of $299. Designed with "Entertainment Freedom" in mind, the WiFi enabled VIZIO Tablet comes equipped with unique features like a three-speaker configuration for enhanced audio in landscape or portrait modes, built in universal remote app for home theater control and a HDMI® port for HD playback on the big screen. The addition of Hulu Plus bolsters the entertainment value of the sub-$300 VIZIO Tablet, making it one of the most affordable, media centric, Android-powered Tablets on the market. "The VIZIO Tablet was designed to provide a world class Internet content experience and we are proud to be one of the first Android-powered tablets to support Hulu Plus™," said Matt McRae, Chief Technology Officer, VIZIO. "VIZIO is committed to delivering innovative products to consumers that break new ground, deliver new services and address gaps in the industry." *Source: IHS iSuppli Corporation Research Q2 2011 Market Tracker Report of Q1 2011. VIZIO, Inc., "Entertainment Freedom For All," headquartered in Irvine, California, is America's #1 LCD HDTV Company. In Q2 2007, VIZIO skyrocketed to the top by becoming the #1 shipping brand of flat panel HDTVs in North America and in Q3 2007 became the first American brand in over a decade to lead in U.S. LCD HDTV shipments. Since 2007 VIZIO LCD HDTV shipments remain in the top ranks in the U.S. and were #1 for the total year in 2009 and 2010. VIZIO is committed to bringing feature-rich consumer electronics to market at a value through practical innovation. VIZIO offers a broad range of award winning consumer electronics. VIZIO's products are found at Costco Wholesale, Sam's Club, Walmart, Target, BJ's Wholesale, and other retailers nationwide along with authorized online partners. VIZIO has won numerous awards including a #1 ranking in the Inc. 500 for Top Companies in Computers and Electronics, Fast Company's 6th Most Innovative CE Company of 2009, and made the lists of Ad Age's Hottest Brands, CNET's Editor's Choice, CNET Best of CES 2011 - Television, IGN Best of CES - Television, Bluetooth.org Best of CES, Good Housekeeping's Best Big-Screens, PC World's Best Buy, Popular Mechanics Editor's Choice and OC Metro's 10 Most Trustworthy Brands among many other prestigious honors. For more information, please call 888-VIZIOCE or visit on the web at www.VIZIO.com.